Your destination for plant-based restaurants, this list highlights vegan and vegetarian restaurants in the city I know best: NYC. Eco-friendly restaurants are a little harder to find, but that doesn't mean they don't exist. Check out my favorite plant-based establishments of New York City below! Vegan/gourmet pizza/organic. Plant-based pizza concept from Matthew Kenney, opened Feb 2016. Serves vegan cheeses and small plates, organic pizza prepared in a wood burning oven, ice cream and organic wine. The name refers to the high quality "00 flour" used in the pizza dough, which has a lower gluten content than most flours. The restaurant is located between 3rd and 4th Street, and is one of my favorite vegan restaurants in NYC. I always leave feeling comfortably full, not bloated and heavy from lots of oils and salt. My favorite pizza is the Tomato Basil with Cashew Mozzarella (pictured above). Plant-based, non gmo, sustainable, artisanal, and organic whenever possible. Locally and globally sourced from small & family farms, abcV offers some of the best vegan food in NYC. Not too salty and oily, which I find is, all too often, a habit at plant-based restaurants. With a menu co-created by Jean-Georges Vongerichten and Paulette Cole, abcV is here to serve, inform and inspire a cultural shift towards plant-based intelligence through creativity and deliciousness. Offering high vibration foods, embracing balance with beauty, wellness, wisdom, and love to nurture our personal and planetary ecosystems. The half or whole roasted cauliflower, with turmeric-tahini and pistachios; and the beluga lentils with chili oil and black vinegar, yams, broccoli stems, cilantro are two of my favorite dishes. Vegan. Bar Verde brings Matthew Kenney’s passion for plant-based cuisine to a new Mexican concept with influences from other Latin countries. Guests will be treated to an array of sharing plates, including variations on guacamoles, ceviches, chips and salsas, a full taco menu, and a large number of unique main course preparations paired with an extensive list of organic and sustainable tequila and mezcal cocktails in a warm casual environment, located in the heart of the East Village in NYC. Vegan. In 2015 a Brooklyn-based group came together to establish, what was in their eyes, a missing component from the New York City nightlife scene. Fast-forward to today and you’ll find a space that is equal parts cocteleria, taqueria, and danceteria. Vegan. Blossom prides itself as a pioneer in modern vegan cuisine, fusing classic dishes with innovative ingredients and a cruelty-free ethos. They focus on vegan reinterpretations of classic world cuisine, using only the finest and freshest ingredients, locally-sourced and organic whenever possible. Located between 84th and 85th Streets on the Upper West Side, this location features a large, open dining area, as well as a full bar and an upstairs dining area suitable for private events. They also have an outdoor dining area with live music on Tuesdays and Thursday evenings. I suggest the Vegetable Lasagna and a Curried Stuffed Sweet Potato which are both as comforting as they are delicious. Open for lunch and dinner Monday through Friday. Open for brunch and dinner Saturday and Sunday. Vegetarian/Vegan. The Butcher’s Daughter is a plant-based restaurant, cafe, juice bar and “vegetable slaughterhouse." Fruits and vegetables are treated as a butcher would meat: They chop, fillet and carve fresh produce into healthy vegetarian dishes and press them into pretty juices. Their two Manhattan locations serve breakfast, lunch, dinner and weekend brunch. Their newest Brooklyn location serves breakfast, lunch and weekend brunch. The Butcher's Daughter takes pride in their daily-changing menu, which is 100% vegetarian, and mostly vegan and gluten-free. Substitutions for most dietary restrictions, can be made upon request. Vegan/organic/gourmet. Candle 79, from the same owners as Candle Café, offers a warm and fuzzy dining experience of vegan cuisine. Their passion is compassion and sustainability. They share that ethos with their guests through their vegan, organic, and seasonal cuisine. Each day they strive to minimize their carbon footprint, thus making our planet a cleaner, healthier environment to live and thrive in. Their goal is to bring guests, "food fresh from Farm to Table" so everything they serve is free of pesticides, chemicals, and hormones. Candle 79 is located at Lexington Avenue on the Upper East Side. I love the Grilled Flatbread as a starter and the Chocolate-Peanut Butter Bliss for dessert. Vegetarian/vegan/gluten free avail. Cutting edge vegetables with added flavor and no politics in this sleek and stylish restaurant showcasing colorful, pop-tastic dishes from award-winning chef, Amanda Cohen. Dirt Candy was the first vegetable-focused restaurant in the city and the leader of the vegetable-forward movement. It became the first vegetarian restaurant in 17 years to receive two stars from the New York Times, was recognized by the Michelin Guide five years in a row, and was the first restaurant in the city to eliminate tipping and share profits with its employees. A full bar, counter seating, a wine list curated by sommelier Lauren Friel, and vegetables in all their earth-shattering, gob-smacking glory. Dirt Candy offers an a la carte menu at the bar and at brunch. Diners coming for dinner will have a choice of The Vegetable Patch ($57, tip included) featuring five courses of Dirt Candy’s greatest hits, or they can take a trip to The Vegetable Garden ($83, tip included) which is at least nine courses and changes according to the season, what we’re experimenting with, and what our foragers and farmers bring to our door. Open for dinner at 5:30pm, Tuesday though Saturday (closed Sundays and Mondays). Last tables seated at 11pm. Open for brunch from 11am - 3pm on Saturdays and Sundays. Vegetarian/Vegan/Ayurvedic. Divya’s Kitchen believes that food can heal, and is devoted to serving delicious food that your body and mind say YES to. Their fresh, balanced meals are prepared with love, deeply rooted in the authentic tradition of Shaka Vansiya Ayurveda. Ayurveda (the ancient medical science of India) teaches us how to maintain balance on all levels and how food can restore our innate ability for healing and wellness. EAT WHOLESOME. FEEL AT HOME. Divya’s Kitchen provides Ayurvedic cuisine that meets us where we are today. I recommend the Curry Bowl with Lentils for lunch and the Vegan Carrot Risotto for dinner. Vegan/Korean. This upscale vegan restaurant serves traditional Korean dishes in a serene setting, with ancient decor and traditional folk music. Shoes must be removed at the door. There is a fixed price menu that comes with starters, appetizers, entrée, and dessert. An á la carte menu is also available with several other options, including salads, soups, rice and noodle dishes, stews, and much more. I recommend the Organic Wild Mountain Roots and Greens for dinner. If you visit HanGawi for your birthday, you can be dressed in traditional Korean attire for your meals to celebrate and be photographed by the staff to remember the special occasion. Vegan/Mexican. “A patchwork of culture, community, and comida threading plant-based eaters to the Mexican palate.” JaJaJa is where south of the border flavor meets Lower East Side flair to create global experiences rooted in local heritage. Opened Cinco de Mayo 2017, JaJaJa is the latest venture for Raise Hospitality Group, owned and operated by old friends and business partners Koorosh Bakhtiar and Nima Garos. The venue features a playfully curated Tequila and Mezcal program, as well as Mexican beers on tap, Mexican-style lagers and pilsners from local microbreweries, fresh pressed juices, and plant-based street food with options for both comfort and health. Serving lunch, dinner and brunch on the weekends. I recommend the Chips and Guacamole for a quick snack, and the Tumeric Cauliflower Rice for dinner. Open Sun-Wed 11:00am-12:00am. Thurs-Sat 11:00am-1:00am. Only accepts walk-ins, no reservations. Vegan/Japanese. Kajitsu serves Shojin cuisine, an ancient Japanese cuisine developed in Zen Buddhist monasteries, that focuses on fresh ingredients and artistic presentation. Following the Buddhist principle of not taking life, no animal products are used. The menu changes monthly according to what is in season. Diners can choose between two prix-fixe menus -- four or eight courses. The meals are served on handmade ceramic dishes, some of which are antiques. You will find Kajitsu between 1st Avenue and Avenue A in the East Village. Reservations are recommended. Vegetarian/Vegan. Le Botaniste is a healthy, delicious, plant-based, organic food & natural wine bar. “Let food be the medicine” is at the top of every menu. They aim to be a responsible food concept that cares about health and our planet. They offer a positive way to appreciate food and are 100 % botanical, 99 % organic, and gluten-free. Although I haven't been here yet, I look forward to trying their Tibetan Mama Rice Bowl and the Dirty Noodle Soup. They also have a great option to make your own bowl based upon your personal cravings of the day. Vegan. Modern Love offers elegant plates of vegan comfort food. Served in a charming cafe with modern-meets-retro decor, this new Williamsburg vegan spot is becoming a local favorite. I recommend the Hen Of The Woods Piccata with whipped potatoes, gigantic lima beans, escarole, and lemon wine caper sauce. Vegetarian. Vegan. Nix is a new restaurant from Michelin-starred chef John Fraser, drawing on his personal passion for cooking with vegetables. With the belief that eating vegetarian or vegan should feel more celebration than sacrifice, Nix features dishes that are seasonal, shareable and highly flavorful. Innovative cocktails, house-made sodas and an affordable, adventurous wine list complete the menu, all served in a lively Greenwich Village atmosphere. I recommend the Tandoor bread with House Hummus and the Warm Avocado, Lentil French Curry. Open for dinner, lunch and weekend brunch. Macrobiotic/organic. A NYC legacy in health food, Souen is one of my favorite plant-based go-tos. ****Please note that fish is served here. They offer a macrobiotic menu with sushi, soups, salads, noodle dishes, and much more. If you're curious about a Macrobiotic diet, I have a post all about it... CHECK IT OUT HERE. My favorite dishes at Souen are the Macro Bowl and the Tahini Shoyu Ramen with Organic Zucchini Noodles. Vegan/organic/raw foods/juice bar. Sun In Bloom is a conscious company committed to sharing clean, delicious, wholesome, and living foods that nourish the body with energy and love. Sun In Bloom’s menu offers accessible “clean” and gluten-free dishes to be enjoyed by all food lovers (everyone). They specialize in organic, plant-based, vegan, raw living cuisine that integrates macrobiotic foods and philosophy. Although there are a few tables at Sun In Bloom in TriBeCa, it is mostly a take-out eatery. I recommend the Hearty Macro Bowl and Chef Aimee’s Macro Salad. Open Monday through Friday for three meals. Open Saturday and Sunday for breakfast & lunch. Vegan. XYST brings Matthew Kenney’s passion for plant-based cuisine to a new Mediterranean inspired restaurant in Chelsea, NYC. The menu is divided into four segments: cheeses, meze, falafel and vegetable dishes. XYST is great for a casual dinner with the option of settling at the smart bar at the front , or for a date night taking one of the cozy tables at the back. Excellent service is a highlight at all of Matthew Kenney's NYC establishments. I recommend the smoked hummus with sumac, harissa oil, grilled pita, and crudite; or the shiitake stuffed cabbage with smoked tofu and carrot saffron to start. The wild cultivated mushrooms with kale polenta, fennel, and umami powder was a delicious main course that delightfully filled my never-ending cravings for mushrooms. Open Mon-Fri 5pm-11pm; Sat-Sun 11am-4pm Brunch, 5pm-10pm Din. Vegan options. ***Serves meat as well** Ancolie is a 4 Star Certified Green Restaurant® and curates the perfect balance between indulgent eats and healthy meals. You don’t have to think too hard, because everything there is good for you (especially the plant-based options, if you ask me). When you eat at Ancolie, you contribute to a responsible ecosystem, because their meals are served in glass jars and not plastic. They ask you to carry on this mission daily by reusing their glass jars and being mindful of your consumption of disposable cups, utensils, and bags. Although this restaurant isn't exclusively plant-based, each menu item has the option to be made vegan. My favorites are the Coconut Chia Pudding for breakfast and the Vegan Grain Jar (ask for it with cauliflower instead of chicken) for lunch. Vegetarian/sushi. Beyond Sushi serves a unique alternative to traditional sushi. With fruits and vegetables, including kiwi, mango, carrots, and snap peas, everything is vegetarian. The sushi is wrapped in black Chinese forbidden rice and six grain rice. Beyond Sushi offers a variety of vegan rolls and many of the rolls served are gluten-free as well. Each roll comes with a customized tofu and veggie sauce, including jalapeno-wasabi, carrot-ginger, and mango-chili. Vegetarian/Vegan/ Indian. Indian-influenced vegetarian café. Some of the sandwiches served are the Chana Masala, the Veggie Mashup, and the Smorgasburg Sweet Potato. Wraps include the Organic Quinoa and the Kale and Sweet Potato Wrap. They also serve bowls including French Lentils. Vegan items are clearly indicated on the menu. Located between Broadway and Sixth Ave.
Open daily for lunch and dinner. Closed Sunday (midtown only). Multiple locations in NYC. Visit list on their website here. Vegan. by CHLOE. is 100% vegan, plant-based, and kosher certified fast food. Their menu is free of meat, dairy and egg products and contains no saturated animal fats, cholesterol, added preservatives and/or artificial flavors. by CHLOE. is committed to using seasonal & locally sourced ingredients whenever possible. All menu items are prepared from scratch including their patties, condiments, sauces, cheeses + grab and go offerings. All Sweets by CHLOE. are baked fresh in-house daily. Not a health joint, but healthier and definitely less oily than your typical fast food spot. I recommend The Classic Burger and the Air Baked Fries with Beetroot Ketchup. Vegan/organic/natural foods. "Vegetarianism is taken to a whole new level" at this all-vegan restaurant. Candle Café, sister restaurant to Candle 79, serves unique dishes like a Grilled Rosemary Tempeh Sandwich and a Grilled Tempeh Portabello Burger, as well as a rotating selection of entrées, such as Seitan Toastadas, Lentil Croquettes, and Hijiki Caviar. Candle Café on 3rd is located between 74th and 75th Streets on the Upper East Side. During the summer I love their Vegan Summer Rolls, and during the fall I suggest the Aztec Salad. Vegan. Champs Diner offers indulgent, meat-free versions of foods you would find at any other All-American diner. From comfort, junk-food bar snacks like buffalo fries and pizza tots, to heaping breakfast plates (think birthday cake pancakes), to Philly cheesesteaks, burgers and hot dogs. Not a health spot for vegans, but delicious when you're in the mood for something savory. Vegan options. ***Serves meat as well** Cocoron specializes in Japanese soba. They aim to create and serve dishes that are both hearty and healthy. Serving unique soba noodles with nutrients made of buckwheat and unique appetizers blended with Japanese taste, Cocoron's soba noodle soups, dips, and curries are delicious and wholesome. They are passionate about feeding their customers hearty, nourishing meals made from whole ingredients that can have a positive impact on their overall mind, body and health. Although this restaurant isn't exclusively plant-based, their extensive vegan menu make it easy to dine here, which isn't the usual case at most Japanese restaurants. My favorite is the Vegan Warm Sansai Soba made with a kombu kelp and soy sauce based broth. Vegan options. ***Serves meat as well** Indian cuisine is rooted in the belief that food should provide nourishment for your body and balance for your life. INDAY is born from this tradition: a place where you don’t have to decide between eating delicious, exciting food and eating healthy, responsible food. I recommend the (G)rainbow(l) as a meal or the Karma Cup for a snack, and the Avo Cocoa for dessert if you've got a sweet tooth. 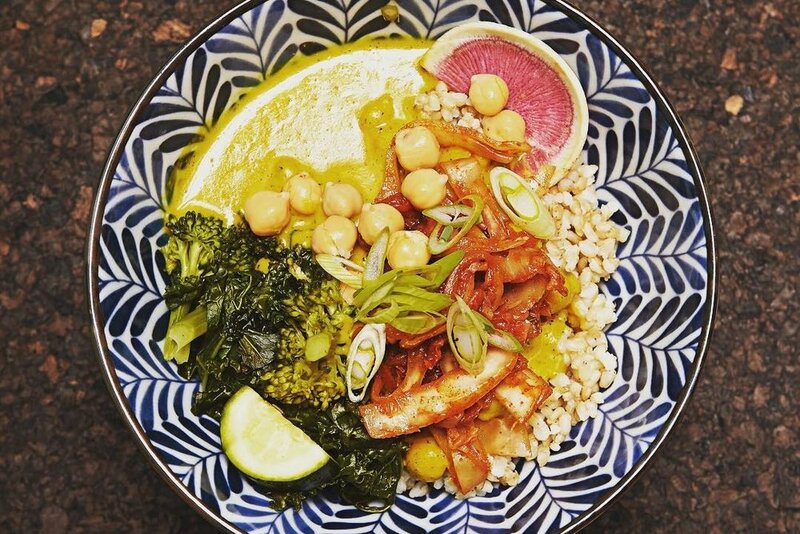 You can also customize your vegan own bowl if you're feeling adventurous. Vegan/organic/café. Jivamuktea Café is located inside Jivamukti Yoga School. They are a deli-style café serving soups, salads, sandwiches, and a few other vegan specialties. They bake vegan desserts daily and have a large coffee, tea, and juice menu. Vegans who may feel left out of New York City’s ever-popular deli scene need just a visit to this vegan appetizing shop to load up on old school delicacies, veganified. Lox made out of thinly ribboned carrots, cream cheese made from nuts and a knockout Reuben sandwich starring seiten and aquafaba Thousand Island may just make veganism the newest New York classic. Vegetarian/organic. The Organic Grill (between 7th Street & St. Marks Place) boasts that "99.9% of our foods are prepared using clean, sustainably raised materials." For a tasty treat, try the BBQ Seitan Sandwich, Eggplant Caponata with Herb Crostini, or the Vegan Wheat-Free Waffles. All cheese dishes can be made with vegan cheese. Orders and reservations can be placed from The Organic Grill's website. Vegan/natural foods/bakery. Peacefood Café's menu includes panini, pizza, vegetable tempura, chickpea fries, strawberry shortcake, and raw key lime pie. Locally-grown ingredients are used whenever possible. Desserts are baked in their own kitchen with no dairy, egg, or refined sugar. Peacefood on Amsterdam is located uptown at 82nd Street while the café on East 11th is located downtown at University Place. I recommend the Fluffy Quinoa Salad and their fresh pressed juices. Vegetarian/Vegan. Superiority Burger is not a health food joint by any means. Created by Brooks Headley, daily specials are improvised from Greenmarket finds. Unlike many vegan/ vegetarian establishments, they keep their prices low. They therefore offer a cruelty-free, but just as delicious, alternative to NYC fast-food burger joints. Some of the menu is vegetarian, but most of it is easily made vegan. People swear by the Superiority Wrap with Koda Farms' organic brown rice tofu and cabbage sunflower crunch. Open Wednesday-Monday 11:30AM-10PM. Closed Tuesdays. Vegan/organic/food truck. The Cinnamon Snail is a vegan food truck that serves mostly organic food, prepared without processed or artificial ingredients. They offer gluten-free, macrobiotic, and raw food options. Try the Creole Grilled Tofu Sub, Korean Barbeque Seitan, or Maple Mustard Tempeh Sandwich. The menu changes with the seasons and their whims; weekly specials are offered. They also offer a selection of vegan desserts and pastries (baked fresh daily) including Cinnamon Buns (after which the truck is named). All packaging is 100% biodegradable and compostable. In addition to offering delicious vegan food, The Cinnamon Snail also serves to educate the public about sustainable and local agriculture, animal welfare and non-violence. The truck does not operate in very bad weather or when on catering jobs. For locations and times, follow them on Twitter or Facebook. They also run Certified Orgasmic, a vegan and organic full-service caterer. Cash only. Vegan/soul food. Seasoned Vegan is a restaurant run by a mother and son duo. They specialize in gourmet vegan soul food. The menu features southern, Caribbean, Moroccan, and Asian comfort foods, with specials such as "Crawfish" in basil sauce, Mango "Beef" and "Chicken" in ginger sauce. They also offer delicious cakes, such as spicy chocolate or beet flavored, many vegan sandwiches, kale or mushroom salads, and much more. Seasoned Vegan is located near Columbia University at the corner of W. 113th Street in Harlem. Reservations are accepted. Vegan/juice bar. Grass Roots Juicery is great local juice bar based in East Williamsburg. They promote healthy living through organic cold press juicing, smoothies, fresh-squeezed juices and healthy food options. Their organic cold press juice blends can be purchased pre made from their fridge, and their juice blends and smoothies are made to order. Their juicery offers food and products carefully curated for their neighborhood customers, using vegetables and fruits from local farms whenever possible. Their sandwich selections vary with the seasons and feature choice ingredients to bring food that is simply prepared and filled with flavor. They try to fill the community not only with their highly regarded juices and health foods, but also education and encouragement. HEALTHY LIFE, HAPPY LIFE! I love the Grass Roots green juice and the Açaí Bowl (with my own reusable spoon). All of their juices now come in reusable glass bottles, to reduce plastic waste!! Vegan/juice bar. Juice Generation is my favorite juice bar chain in NYC. Not only are they completely vegan and serve delicious fresh juices, smoothies, and açaí bowl, but they also care deeply for the environment. Unlike many take-away juice spots (read Juice Press and Liquiteria), they try to limit their plastic and carbon foot print however possible. Open since 1999, they are part of a growing movement of people who believe that healthy living can be accessible to everyone—and that the key to a sustainable lifestyle is good habits that stick. Juice Generation is a proud member of the Green Restaurant Association, a national non-profit that helps restaurants and consumers work together to become more environmentally responsible. It is among the top NYC restaurants participating in NYC's Food Waste Challenge, which is aimed at reducing the amount of edible waste sent to landfills. Juice Generation is committed to using as much organic and local produce as possible. As an independent New York City company, they love supporting independent farmers in New York and the Northeast because they're essential to the greater health of our community and environment. All of the cold-pressed juices and raw foods are Certified by the Non-GMO Project, which guarantees that they only source produce and products that are void of GMOs. I love the Supa Dupa Greens juice (fresh so I can use my own bottle) and the Hella Good Greens acai bowl (with my own spoon to eliminate waste). Vegan/juice bar. Juice Press is on a mission to create the most trusted nutrition and wellness brand on the planet. Founded in 2010 with the vision of bringing a healthier, more transparent lifestyle platform to the market, they offer an expansive USDA organic product line as well as a variety of lifestyle resources. In seven short years, Juice Press has opened more than 70+ retail stores and is now recognized as THE premiere organic “grab and go” health food provider. Juice Press produces an unparalleled selection of organic, plant-based products and combines them with a short shelf-life to deliver customers a variety of fresh, nutrient dense products. THEY USE A LOT OF PLASTIC. When I order the Green Bowl, my favorite summer treat, I always ask for it without a lid, and bring my own spoon. Vegan options/juice bar. ***Serves meat as well** Dr Smood is an organic boutique cafe offering a carefully crafted menu of performance food for mind, body and soul. They work closely with their partners to produce the highest quality products from sustainable sources, pure water and nutrient rich soil. Never artificial. Never processed. Always Organic. Apart from being USDA certified organic, they are certified kosher and Non GMO. Dr Smood strives to provide "smart food for a good mood". They are interested in the science behind food, what’s going on at a molecular level – the nutrients, minerals, vitamins, antioxidants, proteins, enzymes and fats that our bodies can use to make itself work, feel and look even better. All of their sandwiches are served on their signature Performance Bread made from Organic Spelt flour and Organic Millet Flakes. The blood-sugar stabilizing attributes of their bread (no pesticides, no GMOs, and no added sugars) allow an increase in energy levels. THEY USE A LOT OF PLASTIC. Try asking if they will make your Live Juice and give it to you in your own reusable glass bottle. If they won't for NYC health codes, ask for your drinks without a lid and NO STRAW! Vegan/bakery/kosher. BabyCakes NYC is a specialty vegan bakery that serves mostly organic and gluten-free sweets including cupcakes, cookies, muffins, cinnamon buns, brownies, and cakes. Refined sugar is never used; most items are sweetened with agave syrup. Among the tempting treats are Vanilla Macaroons, Blueberry Crumb Cake, Chocolate Chip Cookie Sandwiches, Pumpkin Spice Loaf, and Red Velvet Cupcakes. Besides local delivery by messenger, many items can be ordered for shipment in the United States. BabyCakes is located on the Lower East Side between Orchard and Ludlow. Vegan options/eco-bakery/organic. Birdbath Green Bakery is the eco-minded little sister of City Bakery. Birdbath asks the question: How does a small bakery in a big city operate in an environmentally friendly way? There are seven Birdbaths in New York, designed by our baker, a collection of sweet and eclectic bakeries like none other. Birdbath was built with their own hands as much as possible, using bamboo and grasscloth and even walls made from wheat and sunflower seeds. They use new-fangled green building materials next to vintage wallpaper and antique flea market finds. They also deliver food by bicycle rickshaw. The Birdbath menu is sweet and savory, lots of organic and local, part vegan, always seasonal, part new age baking and part old-fashioned traditional bakery. The one constant is Birdbath quality and creativity. I think birdbath has the best vegan cookies in NYC, and recommend the Vegan Chocolate Chip Cookie and the Vegan Raspberry Bran Muffin. Vegan/bakery/organic/kosher. Dunwell Doughnuts is an all-vegan doughnut shop that has treats so good, that even NYC's non-vegans seek them out. Founded by Christopher Hollowell (the "Well" in Dun-Well) and his buddy Dan Dunbar (The "Dun" in Dun-Well) after being unable to find a vegan doughnut in NYC that satisfied his cravings. Christopher and Dan made it their quest to create an amazing cruelty-free doughnut, and opened NYC's first all-vegan doughnut shop.